CoR is designed to allow you to decide what you want your character to become. Any race can pick from the three main classes: Warrior, Archer, and Mage. Once your character reaches level ten, he/she will be able to choose one of two disciplines. These disciplines can be either offensive or defensive. Defensive discipline. Increases the player's ability to take on huge amounts of damage as well as the use of shields. Knights have as their main role the purpose of tanking enemies and dangerous creatures, as well as protecting their allies with defensive auras and buffs. Offensive discipline. Increases the attack damage the player deals because of the use of bigger weapons and more strength. Being the highest damage dealers, their purpose is to head up front in the battlefield, by being smart and dangerous at the same time. Defensive discipline. Allows the player to train a pet and use skills to make a target easier to hit. Blended with nature, Hunters are the only characters able to mimic with their environment, by turning themselves and their allies invisible. Ideal for ambushes and surprise attacks. Offensive discipline. Grants the player the ability to inflict powerful attacks at a long-ranged distance. Marksmen play the role of controlling the enemy advancement in the battlefield, by both penalizing enemies as well as providing fire support for their melée allies. In order to fulfill these tasks, they have the longest attack range in combat. Defensive discipline. Allows the player to summon creatures and use defensive spells. Wielding specially designed support abilities, Conjurers are the only characters able to heal their allies and replenish their mana, as well as assist them with powerful buffs that provide a huge help in battle. Offensive discipline. Grants the player the ability to cast devastating spells on the target. Warlocks transform their mana in a wide variety of offensive and crowd control spells. Even if they have a vulnerable appearance, they can destroy their enemies by draining both their mana and their health, as well as crushing them with DoT (damage over time) abilities. Attributes define your character. There are five in total and will show how strong your character is, how fast his/hers health and mana regenerate, and how often he/she can hit a challenging opponent. It's an attribute that reflects your characters physical abilities. It influences attack power for warriors and carry weight. Affects the recovery rate of your characters mana (powers) bar and the mage's spell values. Affects your character's agility and defense. It also affects archers' attack strength. Represents the ability of a character to focus and ensure a direct hit on the target. Determines how much health your character has, and how fast it will regenerate. Many items have attribute bonuses that will help your character be stronger! To better defend against enemy attacks, you will be able to purchase and equip armor. The type of armor your character can use will be based on the class you choose. Warriors can use breast plates, pauldrons, gloves, helmets, and leggings. Archers use more flexible leather armors, pauldrons, gloves, helmets and leggings. And mages use tunics, head gear and gloves. You can purchase your armor in the towns' stores. You will have to find a merchant who sells your type of armor. Remember that some armor will not be able to be equipped until you reach a certain level and/or get enough money. These will be the most important items you will own in your adventures. Weapons enable your character to attack. All weapons have different strengths and weaknesses. If your weapon breaks, you can repair it by taking it to a merchant. You can purchase new weapons there as well. Weapons have the same requirements as armor. Your chosen class will decide what types of weapons will be available to you. Warriors are offered the choice of slashing -swords and axes-, piercing -spears and rapiers-, or blunt -hammers and maces- weapons. 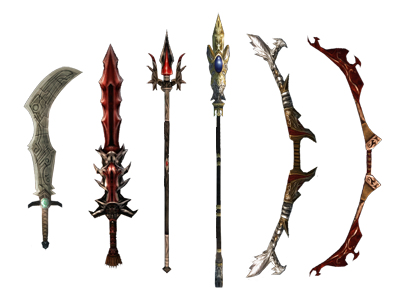 These are all melee weapons and require the player to remain physically close to their target. Archers can use long and short bows -all bows require you to purchase arrows-. The bows allow the player to remain a short distance away and attack. The mage uses magical staffs which can be used for close range attacks as well as attacks from afar. All weapons have subclass, level, and gold requirements as armors have. As you progress through the world of Champions of Regnum, you will be rewarded with gold, items, and most importantly, experience. The Experience Point system allows you to advance your characters. When you first start the game your character will have no experience points and will therefore be at level 1. After your first few moments of play you will find that after you defeat a creature, or complete a quest, you are awarded experience points. If you look at the bottom outline of your action bar, you will see a glowing cyan line. When this line reaches the right edge of your screen, your character will gain a level. Increasing your character's level will increase all of your characters attributes, award you skill points to purchase new powers from your trainer, and enable you to use new weapons and armor.